Malibu High School freshman Josh McConnell shot his lowest score of the season on Thursday, April 23, finishing with 104 strokes at the golf tournament at Olivas Links Golf Course. Coach Cindy McConnell said Josh was struggling with this swing earlier that week, but found ways to improve it for Thursday’s match. She also said his short game and chipping were the best part of his performance. “He’s also been working hard on his short game, and that definitely showed [on Thursday],” Cindy said. The golf team’s roster increased to five players on Thursday with the addition of freshman Keaton Osbourne. He was previously ineligible to play, Cindy said. Osbourne’s debut came with a score of 99, and he shot three strokes better in the back nine compared to the front. Cindy said she noticed that during practice, Osbourne has a tendency to lose focus. But when she saw him compete in his first match, it was a different story. Three of the four Malibu players who competed each had one birdie in their rounds of 18. Freshman Quincy Allen and sophomore Daniel Haines continued their stellar play in Frontier League competition. Allen tied for first place at Thursday’s tournament with a score of 81, and still leads the league in stroke average. Haines shot an 87, putting him at third place overall in the tournament. But with a stroke average of 86, Haines is second in the league. “He had a little bit of trouble with putting but he still kept his position, so that was good,” Cindy said of Haines’ performance. Josh and Haines worked on putting at the practice green after Thursday’s tournament, Cindy said, but she didn’t seem concerned about Haines’ struggles that day or moving forward. Cindy said her two best players still have a lot of room for improvement. The Sharks have one more regular season tournament to play before heading to the CIF playoffs. They will play on Thursday, April 30, at the Mountain View Golf Course in Santa Paula. The Malibu High School baseball team floundered in two straight games against the St. Bonaventure Seraphs last week, extending their losing streak to five games. Malibu’s most recent loss came on Friday, April 17, where it committed a comedy of errors that led to several unearned runs for the Seraphs, and a 13-9 loss for the Sharks. “We just made too made too many mistakes that we just have to cut down on,” second baseman Dylan Ross said after the game. The Sharks started the game off strong. In the second inning and down by only one run, five hits led to four runs, giving MHS a 4-1 lead. But in the top of the third, with two outs, the bases loaded and Bronson Bard pitching, Malibu started to unravel. St. Bonaventure scored two runs, tying the game at 4, after a bad throw to third base by the Sharks. Then a wild pitch by Bard and a missed throw to first put the Seraphs up 6-4. Bard threw another wild pitch that went right past catcher Trevor Simonian, who couldn’t find the ball for a few seconds, and a Seraphs runner scored. St. Bonaventure scored two more runs for a 9-4 lead before the Sharks got their third out. Coach Ari Jacobs was visibly upset after the game while speaking about the team’s struggles this season. “As a coach, watching us break down on things that we constantly prepare for in practice is very frustrating,” Jacobs said after taking a few seconds to carefully choose his words. Before Malibu’s next at bat, Jacobs had a short meeting with team, which seemed to spark its offense. Simonian drilled a shot to deep left field and drove in two runs. Going into the fourth inning, the Sharks were down 9-8 and looking to make a comeback. But St. Bonaventure ran off four runs before Malibu knew what hit them, and sealed the victory before one out was recorded at the top of the fourth. Despite the losing streak, some players on the team are finding silver linings to their struggles. Bard said the team has grown more mature. Jacobs singled out Ross as a bright spot so far this season, and said his second baseman is helping the other members of the team to fight through adversity. Ross, who is the captain of the team, is looking for improved play from the rest of the players. The Sharks will play two games this week versus the Santa Clara Saints starting on Wednesday, April 22. 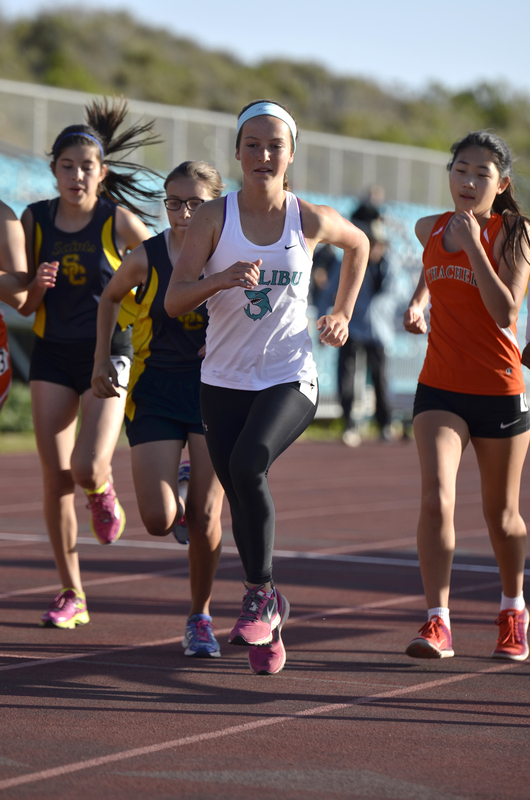 Senior Carorline Pietrzyk runs ahead of the pack during the track meet on Thursday, April 16, 2015 at Malibu High School in Malibu, Calif. 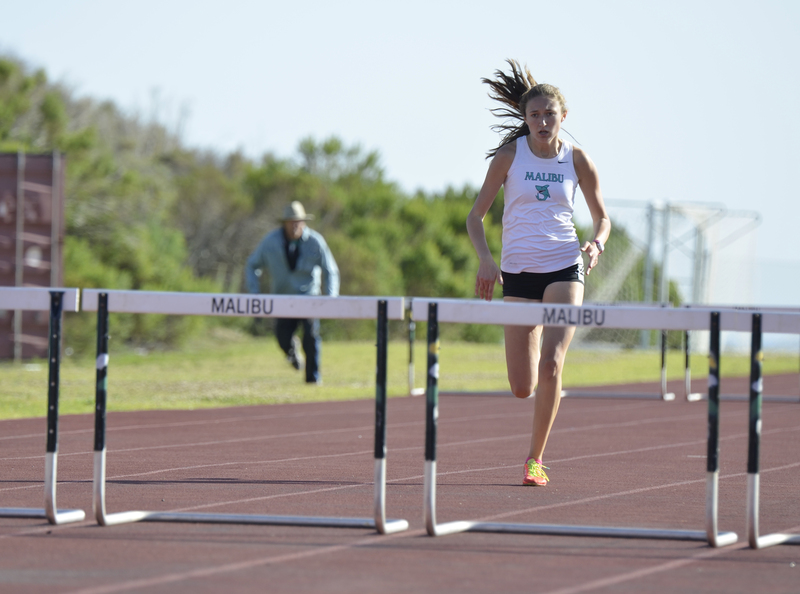 The Malibu High School track and field team is complete again, with many of the girls who were away with the soccer team coming back to compete in the meet on Thursday, April 16. Eva Conrad and Abby Blackwood were among those who recently returned to the roster, with Blackwood making her debut performance in Thursday’s meet. Coach John Cary said the amount of soccer players being away from the team because of invitationals has impacted Malibu’s overall performance this season. Blackwood competed in both the 800- and 3,200-meter runs on Thursday, placing second in the two events. Senior Caroline Pietrzyk finished first in both runs. Blackwood suggested she didn’t mind coming in second to Pietrzyk in the races. 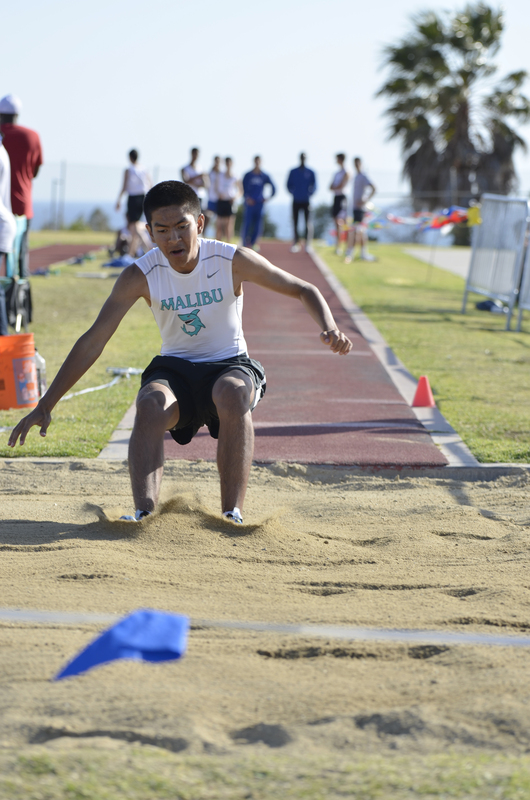 Sophomore Jaime Le, 15, lands in the sand during the long jump event at the track meet on Thursday, April 16, 2015 at Malibu High School in Malibu, Calif. 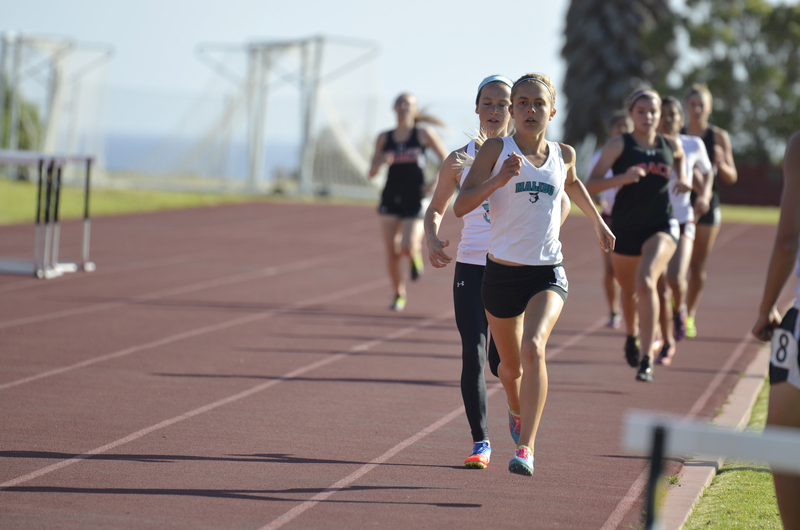 The Sharks totaled nine first-place finishes during the meet, according to the unofficial meet results. Pietrzyk and senior Michaela Cosentino had four of the nine top performances. The Sharks have more athletes competing this year compared to last, which has brought up the level of intensity and improvement so far this season, Blackwood said. Conrad said the younger girls on the team have stood out this year. 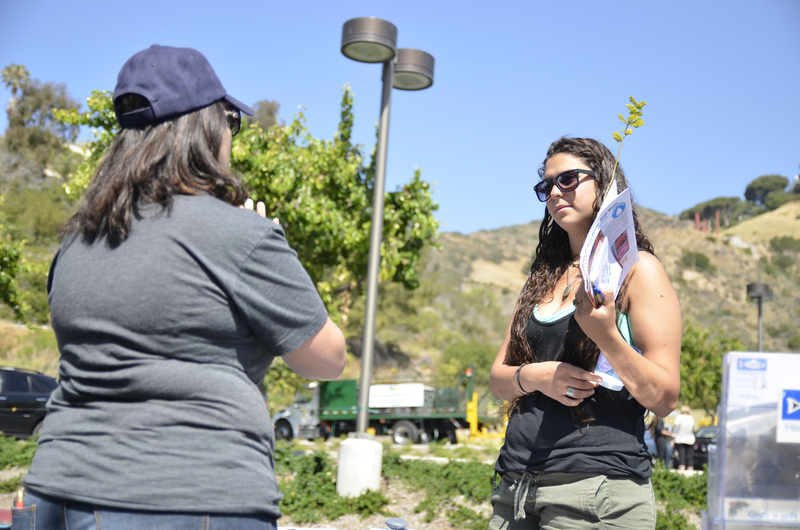 “A lot of them have surprised me by doing so well, even freshman,” Conrad said. In addition to Pietrzyk’s and Cosentino’s performances, other Sharks also excelled in their respective events. Freshman Ella McKinna-Worrell won first place in the 400-meter dash with a time of 1 minute, 2.22 seconds, according to the unofficial results. Sophomore Maverick Baglietto finished first in the 110-meter hurdles with a time of 18.91 seconds. Sophomore Abby Blackwood takes off running during the track meet on Thursday, April 16, 2015 at Malibu High School in Malibu, Calif.
Malibu dominated the field events on Thursday, with Cosentino jumping five feet for a top finish in the high jump event. In the long jump, senior Jenna Weinberger easily won with a distance of 14 feet, eight inches. Three Malibu athletes finished in the top three in the triple jump. Freshman Sara Cosentino won the pole fault event with a final height of seven feet, three inches. Cary said that while the girls’ team continues to perform well, the boys are a different story. The boys will likely not win league this year because of a collective lack of experience, Cary said. “We just don’t have any depth whatsoever in our boys team, because they’re all young,” Cary said. But Cary is confident the girls will have a chance to come away with a league championship, especially now that the whole team is back together. Junior Madeleine Ward, 17, prepares to jump over a hurdle during the track meet on Thursday, April 16, 2015 at Malibu High School in Malibu, Calif. Earlier this year, it was a toss-up whether or not Malibu High School would have a golf team this year. During a recent meeting of the high school’s Athletic Booster Club, Cindy McConnell and Jud Allen had a small debate over who was going to coach golf. After some deliberation, McConnell told the athletic director that she would take the job. “I thought about it for about a week and thought, ‘Gosh, I have time now in my life. I could give this a try and see how it goes so at least the boys have a team that they can play on,’” McConnell said. However, problems with academic eligibility has relegated the golf team to only three players — freshmen Josh McConnell and Quincy Allen, and sophomore Daniel Haines — who compete on an individual basis. Quincy, Jud Allen’s son, is already the Frontier League leader in stroke number, Cindy said. Haines is only behind by two strokes, good for second in the league. Cindy’s son, Josh, decided to try his hand at golf this year. He had never played competitively before, but decided to try something new after water polo season ended. Josh, who is ranked 18th in the league, said being coached by his own mother was interesting, and suggested their relationship on the course was business as usual. Haines said it’s been a good experience having Cindy as coach of the team. As a first-year coach, Cindy relishes in seeing the team get better. One of the players who is improving as the season rolls along is Josh, his mother said. Even though the team only has three players, Malibu has an opportunity to make the CIF playoffs. Haines believes he and Quincy have a good chance at appearing in the postseason in May. 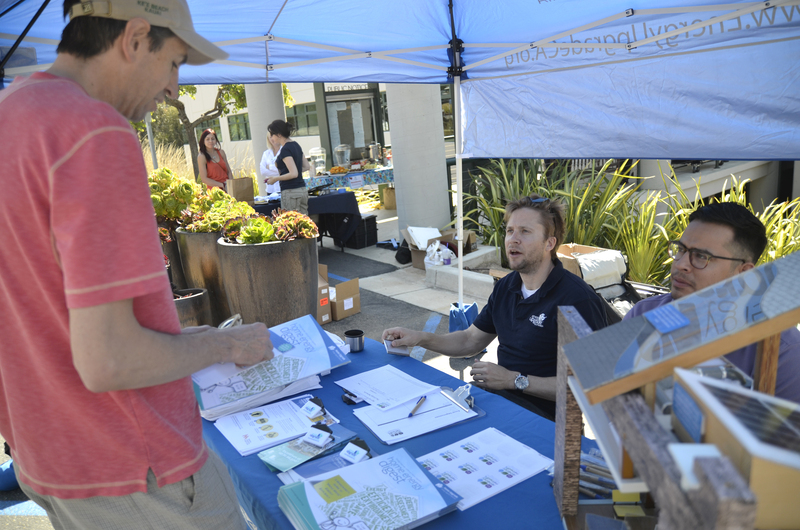 “I’m pretty confident that both of us can do that,” Haines said. In addition to making the playoffs, Haines is looking to shoot even par by next season, and said he will focus on that goal in the offseason. Cindy said Quincy and Haines have their own professionals that help them with specific aspects of their games, and her role as a coach is, at times, one of simply encouraging her players during tournaments. Cindy said the toughest part of playing golf at the high school level is the mental aspect of the game. Josh said he deals with the frustrations of the game by taking a deep breath and focusing on his swing. 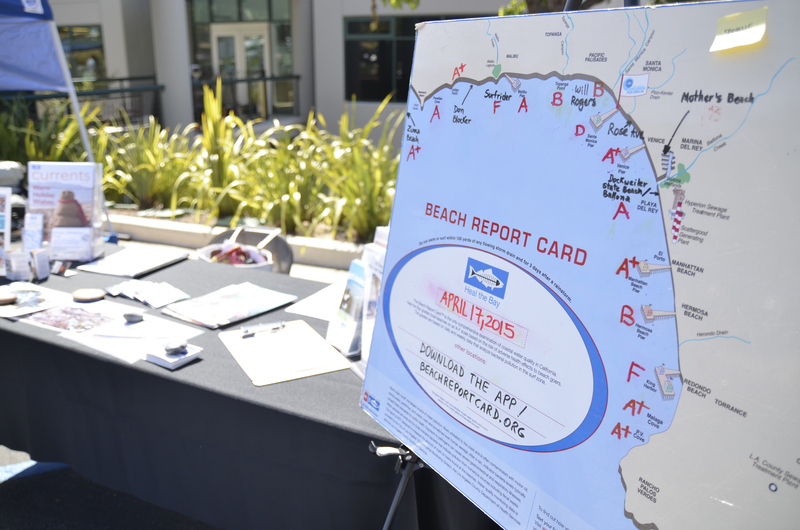 The Sharks’ home turf, the Malibu Country Club, is currently closed after filing for Chapter 11 bankruptcy last month, according to an LA Times article. 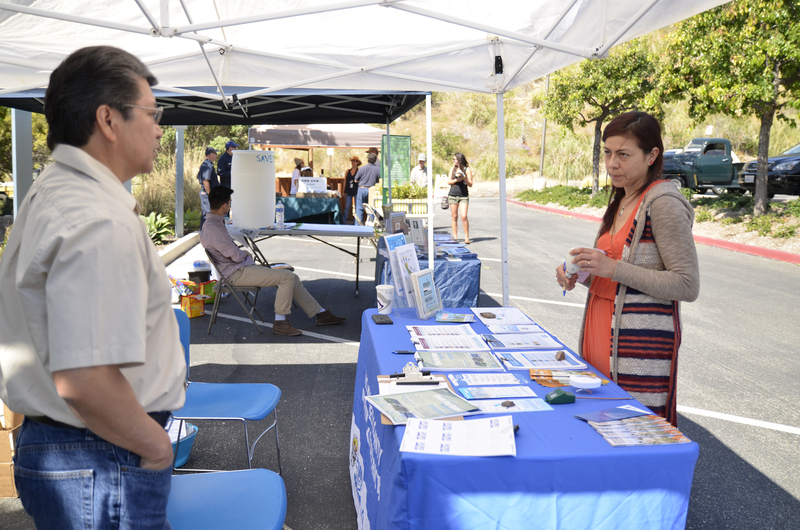 Therefore, the team has to travel to courses in Agoura Hills, Westlake Village and Oxnard. Malibu would need at least six players to compete as a team in the league and for the CIF playoffs. Cindy believes once that happens, the team can achieve great things.